Joyful!! 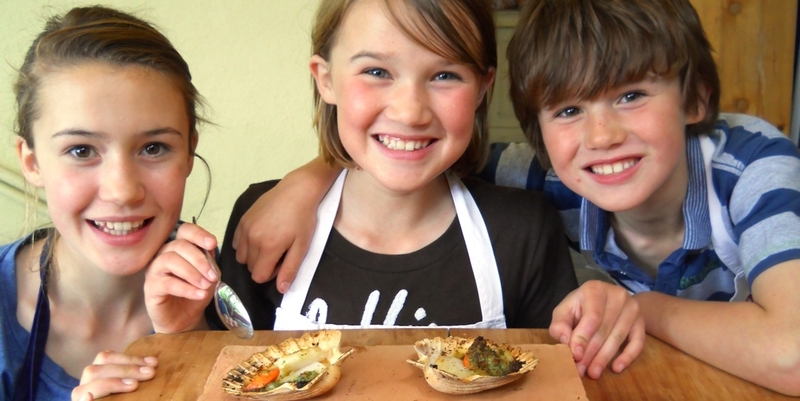 ….. that’s what cooking is for us, and that’s what we want to make it for anyone who takes a class with us at Manna From Devon. We started Manna From Devon in 2006 after David came home from taking a bread course and said, “We should start a cooking school!” We had just finished a two-year stint running the catering at the Royal Dart Yacht Club here in Kingswear, and were busy on the market circuit selling as much bread and pudding as we could possibly produce. At the thought of changing gears toward teaching, something clicked. After all, we’d always had a passion for talking to people about food, and for helping them discover new flavours and kitchen skills. A cooking school would be perfect. Soon afterwards, we welcomed our first set of students to our cosy, sunlit kitchen overlooking the River Dart. What started out as a handful of courses per month has grown into a varied schedule of course offerings, with something for enthusiastic home cooks at any ability level. Want to learn how to fillet fish like a pro or to make the perfect Sunday roast in your wood-fired oven? Curious about sourdough starters or the wide world of curry dishes? We’ve got something for everyone. Check out our classes here. From the very beginning, we have been proud to feature our fabulous local producers in all of our course offerings. 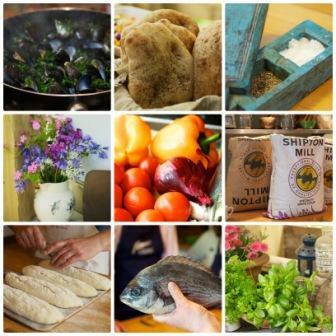 Come to a fish course, and you’ll prepare dishes from a box of fish that came in through Brixham market that morning, via our fishmongers Mark Lobb and Neil Walker, or on a cakes and pastry course and we’ll use organic eggs from Edward Jones at Fountain Violet Farm, just up the road. We keep our classes small, to maximise hands-on time and to allow ample opportunity for questions and conversation, and we finish each class with a big meal around our kitchen table to enjoy the dishes we have made together, to celebrate a successful day in the kitchen, and to toast to many more just like it. 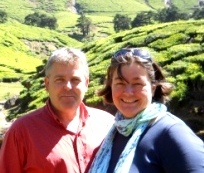 We met at the University of London in 1982, where David studied Philosophy and Holly studied French and German. We immediately bonded over a mutual love of food, though we had no professional culinary experience at the time. Eating was a way of exploring new cultures and cuisines, and a way of building a community of people who loved food as much as we did. After University we both spent time in the services, and embarked on a number of other adventures to distant places like Mt. Kilimanjaro, the African bush, the Southern Ocean, Germany, and even Scotland. Food, inevitably, was often at the core of those experiences. 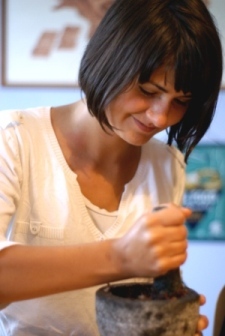 Eventually, Holly moved back to the UK and enrolled at Leith’s Cooking School, after which she worked as a chef, demonstrator, TV presenter and food writer for, among other things, the nascent BBC Good Food website. David spent 15 years working in management consultancy before the call of the kitchen drew him back in. He is our resident bread baker and aficionado of all things leavened, having gained his expertise primarily through experimentation, practice, and that fateful bread course all those years ago. We ourselves are forever students of the senses, and we travel as much as we possibly can to learn about new flavours, techniques, and dishes. While travelling, we try to stay off the tourist trail; more often than not our first stop is the local market where we’ve learned that if you put your camera away and start talking to people about their food (often in the one shared language of wild gesticulation), you start to learn all kinds of fantastic things. We bring these moments back with us, and distil them into dishes that we can teach to our students, hopefully passing on some small insight into a far-away culture. When we’re not teaching cooking courses, you can find us working with other foodie clients, blogging about new adventures, or getting into all sorts of mischief with our two dogs, Poppy and Rex. Manna from Devon is a legal trading name for “Holly Jones Ltd”. In all instances the name “Manna from Devon” is synonymous with the company name Holly Jones Ltd.
What does “Manna from Devon” mean? The name Manna from Devon refers to the biblical ‘Manna from Heaven’, the miraculous food which God caused to appear in the desert in order to sustain the Israelites on their flight from Egypt. To name our cooking school after a miraculous and heavenly food seemed as good a choice as any. The name came to David whilst walking the dogs one afternoon. Although he claims the name came into his head as an epiphany and was therefore nothing to do with any creative genius on his part, he is, nevertheless, always very quick to mention that it was him that thought of it.